Does your insurance policy cover this? It all depends on the fine print. While it’s a subject not often discussed, knowing what’s in your boat’s insurance policy could mean the difference between having to pay significant costs out of pocket for a claim or coming away from the claims experience in good shape. What do you need to know? Boat Owners Association of The United States (BoatUS) takes a look at the fine print on seven of the most important coverages. 1. The consequential damage fine print: Half of all sinkings occur at the dock when some small part below the waterline fails. However, these parts that include such things as an rubber outdrive bellows, for example, most often fail due to “wear, tear, and corrosion” or a lack of maintenance, so the policy won’t pay for a new bellows. But here’s the rub: As a consequence of the failed bellows, your boat has now sunk and a total loss. Who pays for that? Check your policy now for “consequential damage” coverage that pays for these losses that often start with a failed part that may be excluded under the policy. In this case, the failed bellows may not be covered – but the rest of the repairs or total loss (sunk boat) will be. One caveat: This consequential damage coverage often applies only to major or total losses. It’s typical, for example, to cover the immediate consequential damage resulting from any fire, explosion, sinking, demasting, collision or stranding. 2. The fuel-spill liability fine print: In addition to your policy’s standard liability coverage for physical damage or bodily injury to a third party, fuel-spill liability protects you from claims for cleanup or third-party damage from the accidental discharge of oil or fuel that can occur in a sinking, fire, collision or grounding. Some policies just pay the costs associated with a fuel spill up to the policy’s set limit of boating liability coverage. A better policy separates out fuel-spill liability and provides coverage up to the maximum amount you can be held liable for under federal law, which today is a whopping $939,800. 3. The on-water towing fine print: Many boat insurance policies today offer some kind of on-water towing endorsement that provides a level of towing and assistance for routine breakdowns or soft ungroundings. Know how you will be able to use that coverage including who provides the service and does the company have 24-hour dispatch service? Also know when you will have to pay for a tow out of pocket and be reimbursed. 4. The salvage coverage fine print: When fires, sinkings, a marina shed roof collapse or running up on a shoal damages your boat, you end up with a salvage situation. 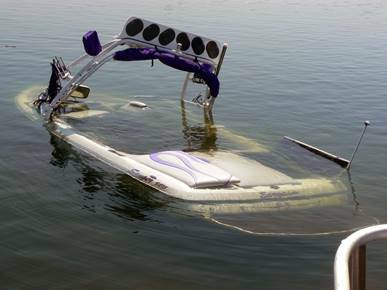 If the boat is not a total loss and needs to be recovered and brought to a repair facility, costs can escalate quickly. Most boaters assume the cost of raising or moving the boat to safe location is covered by their policy, but some marine insurers will subtract salvage costs from the insured value of the boat, reducing the funds available to repair the boat or the amount paid in the event of a total loss. With some policies on a total loss you may receive a check for the boat’s insured value, but only get a small percentage of that insured value – perhaps just 5 to 10 percent – to pay for salvage costs, again forcing you to pay more out of pocket. Better policies provide salvage coverage that is separate but equal to the boat’s hull-value coverage. After all, isn’t that why you insure your boat in the first place? 5. The boat trailer fine print: Not all boat insurance policies automatically provide boat trailer coverage so be sure to check. Also find out if there are geographic limits on where you may trailer the boat. Note that if you have an accident while towing, it is your boat policy that pays to repair or replace the trailer, but any third-party damage your trailer causes to property or injuries to people is covered under your auto policy. 6. The liability-only boat policy fine print: If you opt for a liability-only policy, ensure that it provides not only coverage for property damage and bodily injury to others, but also that it provides coverage for salvage and removal of a wreck, and that separate coverage is available for fuel-spill incidents. 7. Not a coverage but a concern: Do you have the experience to be able to salvage your own boat? Most boaters do not, even for a simple salvage operation, let alone after a major catastrophe. Boaters deserve an insurance provider that can arrange for the salvage as quickly as possible, potentially negotiating with crane operators, truckers, storage facilities, local government officials, marina staff and more. The only way to find out if you’ll be left holding the bag or will get the help you need is to ask around for other boaters’ claims experiences. The marine insurance specialists at BoatUS (800-283-2883) can help you review your current policy. Free quotes are available at BoatUS.com/insurance.